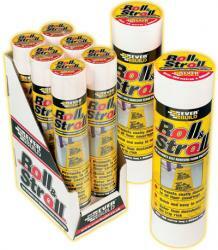 Everbuild - Roll & Stroll Carpet Protector is the ultimate self adhesive carpet protection system. With the adhesive coating on the outside Roll & Stroll Carpet Protector is easy to unwind, safer than dustsheets and has a multitude of uses across all trade sectors. 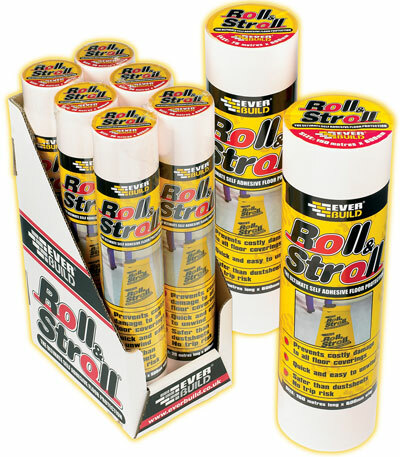 Totally waterproof Roll & Stroll Carpet Protector protects against paint spillage, with a heavy duty anti-slip cross weave it wont tear or rip. Flameproof, will not burn.The 20 mtr size comes in a shelf ready display box.